Go Tropical With Fresh Prints! 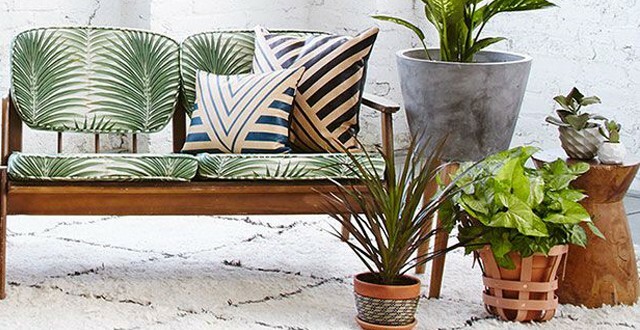 I’M TOTALLY LOVING THE CURRENT TROPICAL LEAF TREND WITH PATTERNED TEXTILES FOR THE HOME AND BEYOND, IT’S SUCH A FRESH AND INSPIRING TAKE ON GREENERY. I would love to be so bold and wear these large colorful prints though I would be more likely to opt for the shoes or the bag, which look so delicate and pretty. The Pantone shade of green called "Treetop" matches perfectly with this trend offering us a calming presence and is supposed to sooth us from all stress. I really need that tee shirt next to the color swatch with the large leaf print in my life - it would look so cute with jeans! 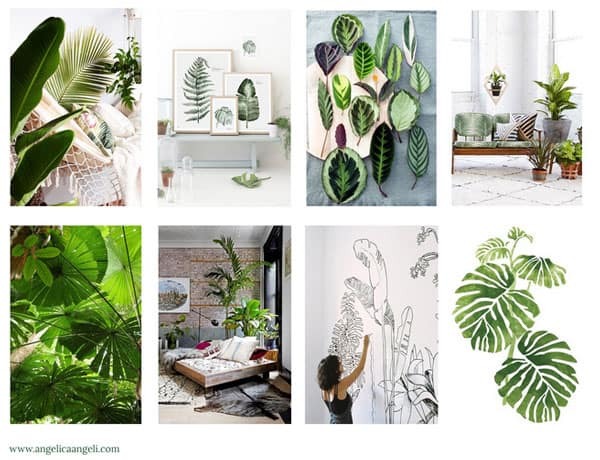 In home decor, this trend could be incorporated through adding leaf patterns, palm plants, leaves placed in a vase, and wallpaper. A simple leaf pattern can breathe life into your room, giving it fresh appeal. Tropical plants paired with white decor is really distinctive and can transform your room into an exotic paradise. By adding real, live plants into your home you will create a better atmosphere and add rich color. The woman drawing onto her walls creates a simple line drawing that is very effective; what a great idea! The framed prints of the leaves also make a strong impact against white walls. I like to see a bedroom fully loaded with plants that has been quite sparsely decorated. There is something special about having the energy of the plants around us, if like me you have no outdoor living area, this is a great way to enjoy nature! 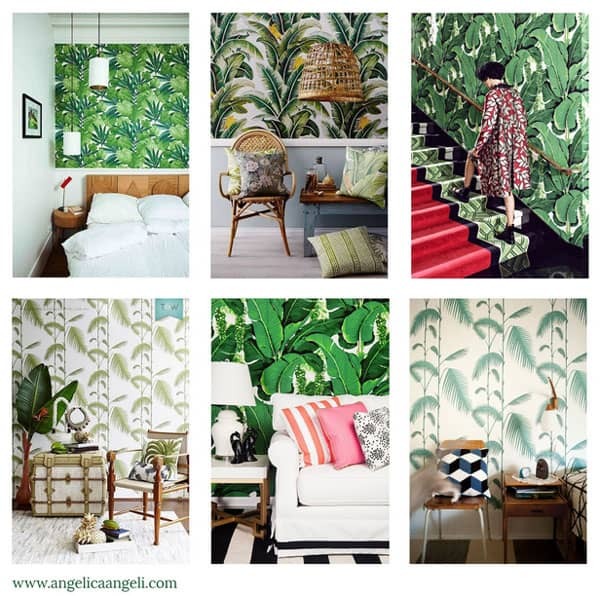 The gorgeous wallpapers seen here are a great example of how tropical leaf prints and patterns can work in the home. From the bedroom to the living room, these busy patterns can bring energy into a space. I love the large leaf print on the wall next to the staircase, this coordinates so well with the patterned rug and rich, red leafy coat the girl is wearing. The more subdued pattern on the bottom left is complemented by home decor accessories and large leaves placed in a tall vase. The wallpapers here are all so striking, making focal points and offering a chic alternative to busy florals. 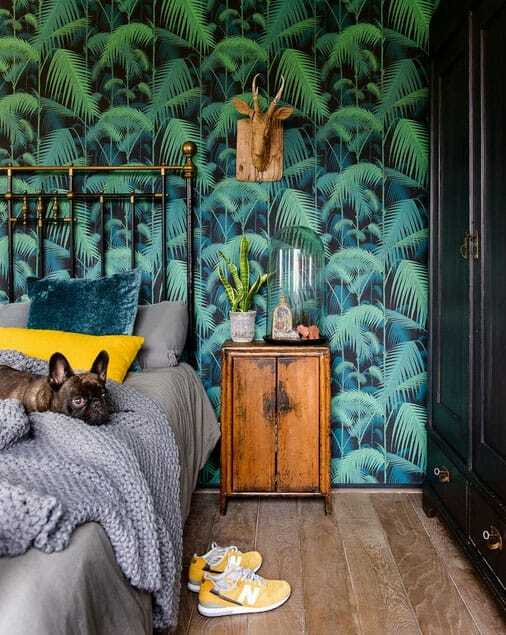 I would definitely decorate my hallway with a bold lively tropical leaf print... if I could only choose one! They are all so amazing! This delightful wallpaper from Limitless Walls brings the exotic into the home, as the clean white space is given a blast of color. The glamorous suite would be the perfect place to unwind and de-stress after a hard day at work. 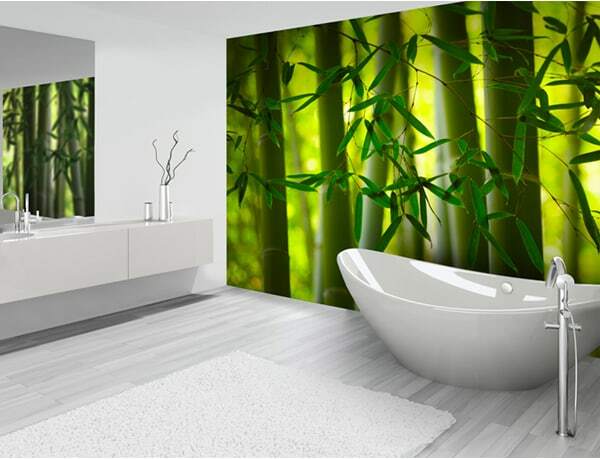 I would love a wallpaper like this in my bathroom and would enjoy looking at it when brushing my teeth in the mornings! 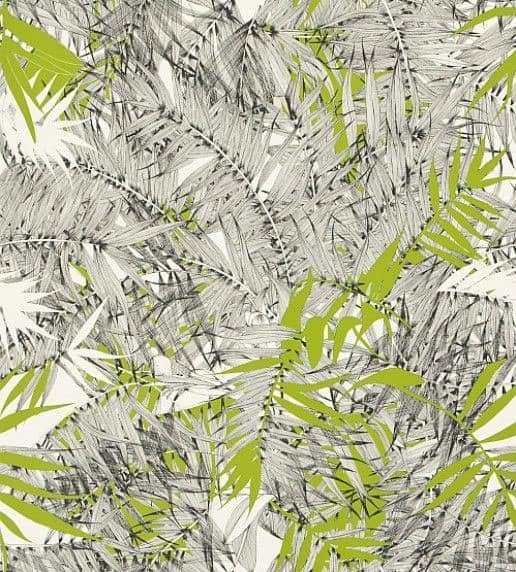 This "Eden Roc Green" wallpaper, by Christian Lacroix, is an all over exotic wall covering featuring dense tropical palms. Shown here in green, black, and white, the overlapping of the leaves makes this a striking pattern. I could see this printed onto fabric, covering a beautiful French looking sofa or as a feature wall in a bedroom. I would love to have this pattern in my home, using any leftover paper to do some crafting and cover my notebooks! 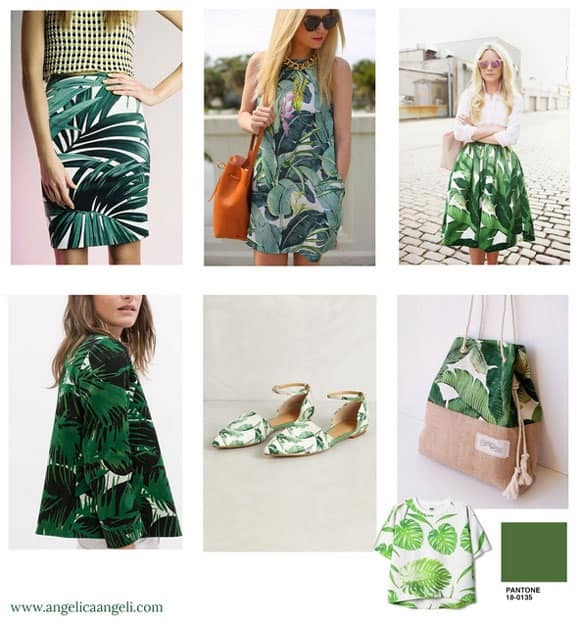 Are you loving the tropical leaves trend at the moment? Do you have any tips or ideas to share?